This post is #4 in a series. The earlier ones are here, here and here. This article also appears on another blog, here on WritersRumpus.com. We see hundreds of excellent children’s books each year published here in the U.S., but what about those published in other countries? 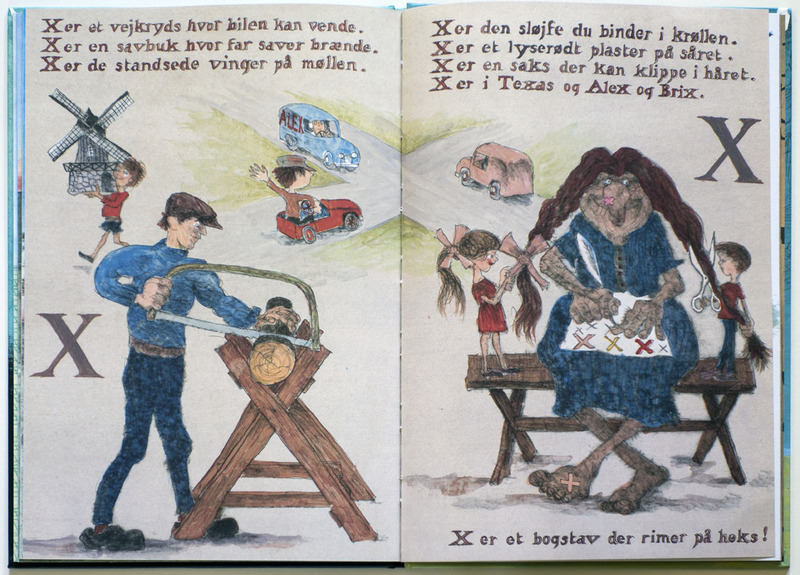 The rest of the world is producing books with interesting pictures for kids, too. What kinds of artwork are done by illustrators from elsewhere? Are they similar or different? What can we learn from them? A while ago I decided to collect children’s books when I travel. Good friends and family have added to that collection. 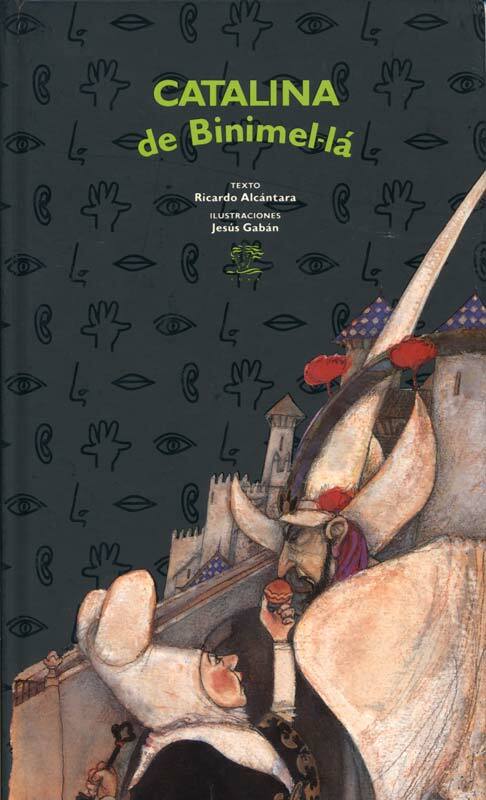 I look for books that seem endemic, that is, written and illustrated by people from the visited country and that portray stories that don’t seem in imitation of something American. The real deal. So far, I have forty-three books from far-off places with intriguing artwork and book design. Many have stories I can’t read, but there are things to be learned from the pictures. 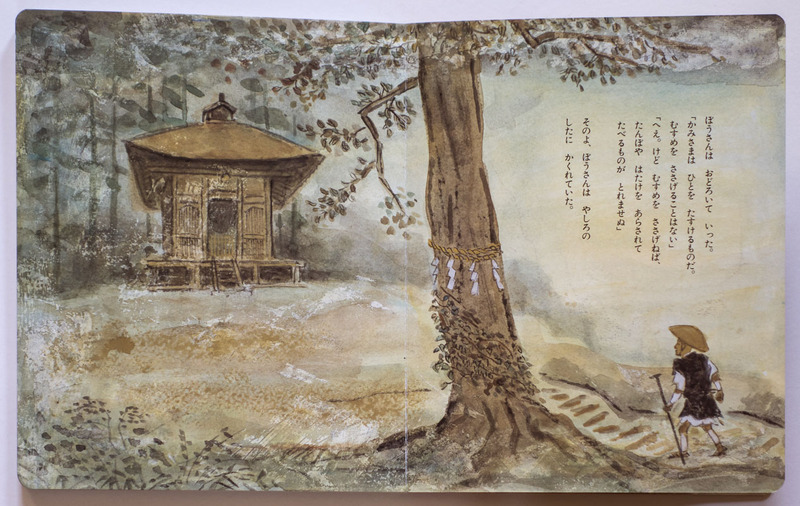 This lovely book (above) was given to me by my daughter Melody who traveled through Thailand and Indonesia. I’m not sure which of those countries this comes from and I can’t read a single word of the gorgeous calligraphic letterforms, but I love the use of patterns in the pictures and the clean, bright colors. Also, the background on every page is white, becoming space, air, and a source of light. 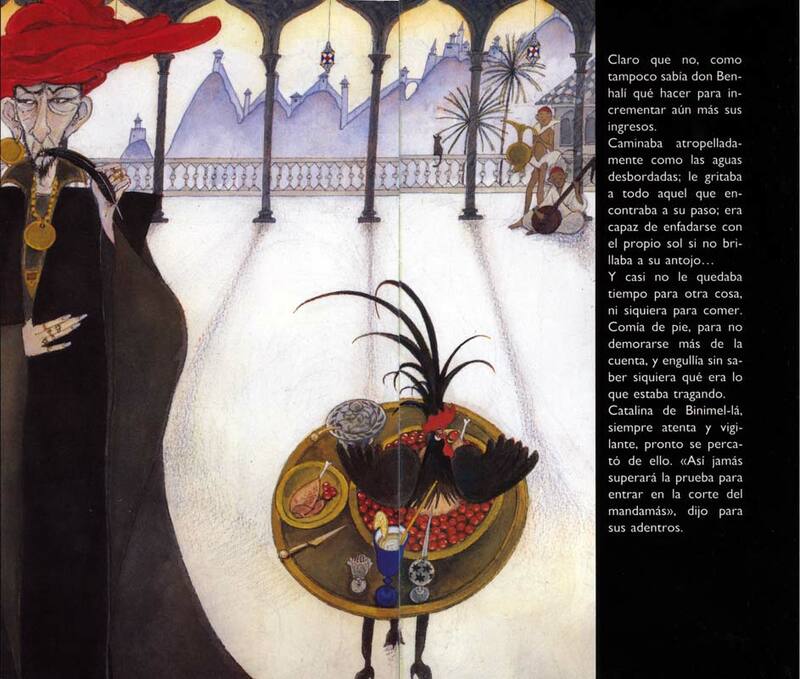 In Catalina de Binimel-lá,written by Ricardo Alcántara and illustrated by Jesús Gabán, all of the backgrounds are dark, here lending a spooky feel that’s compatible with greedy don Benhali’s mood. The powerful sweeping curves and repeated columns along with the sense of mystery the style imparts and use of red highlights gives this book a sense of dynamism. As you can see by the cover, this board book is read from right to left. The interior text flows top to bottom and calligraphy is a lyrical design element of its twenty-four pages. The beautiful watercolor illustrations of this Japanese folktale retold by Matsutani Miyoko, are reminiscent of traditional paintings with textured washes and linear elements done with a brush. It seems more sophisticated than we might expect for a board book presumably for young children. The content of the story is equally mature. I do not have a translation, however here is an attempt at describing what the pictures show. 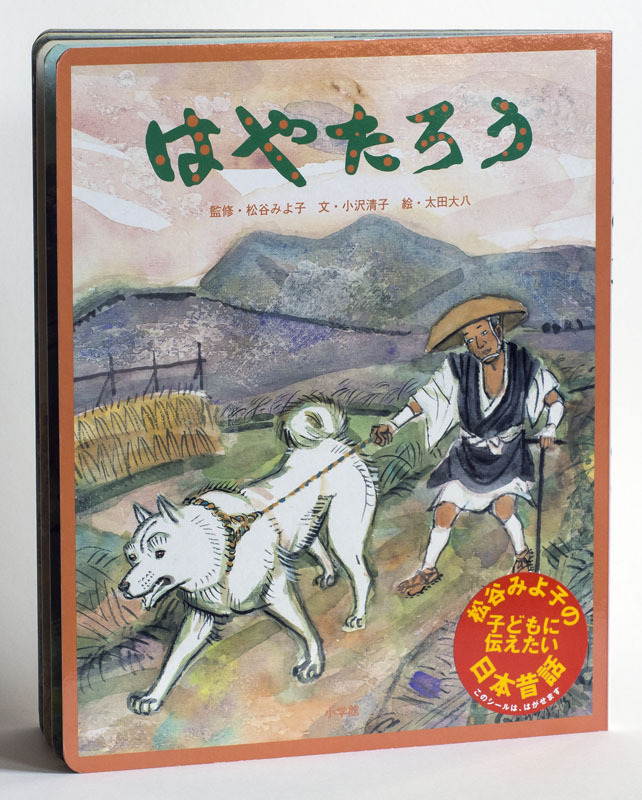 The story appears to be about a man who encounters a village with some serious problem. He tells the villagers to go to a shrine to pray near what seems to be a wooden casket. 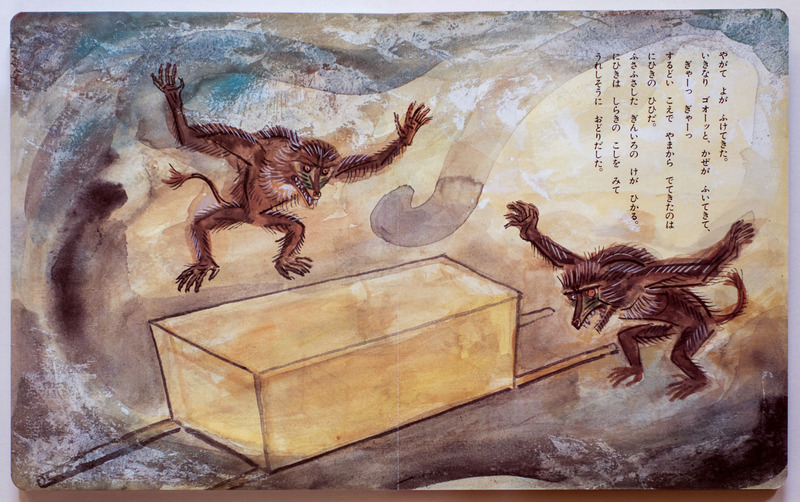 Two big monkey-like beings (or demons?) break the casket open and steal the woman’s body from inside. The man continues on his way, greeting others. Another man chases a white wolf from near a house where people live. Again villagers appear to bring a coffin to a shrine. 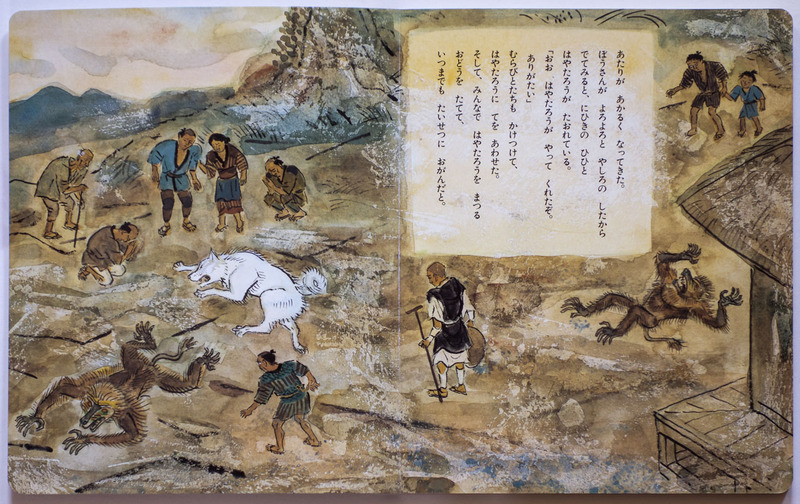 Again the monkey demons come, but this time the white wolf attacks them, killing both, but also sacrificing his own life. The villagers are sorrowful that they had not treated the white wolf well. They now see that he was a good being. It is a powerful story. 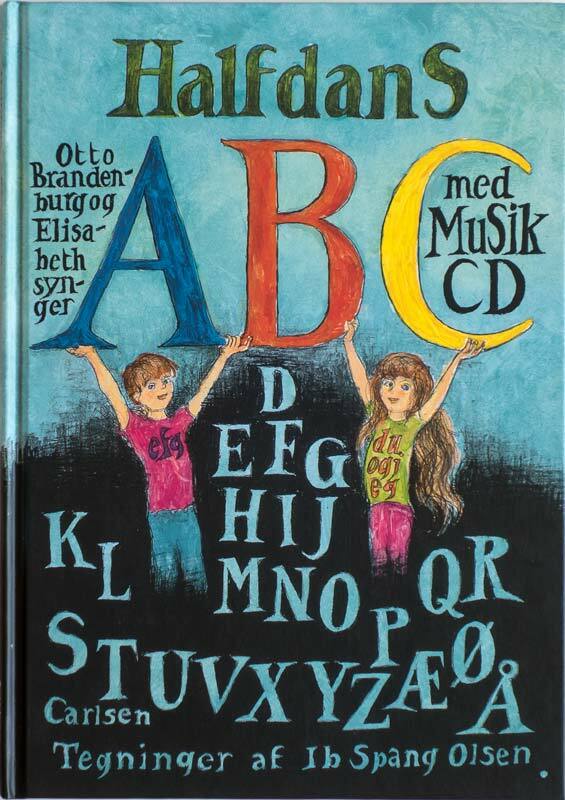 Halfdan’s ABC, published by Carlsen Publishers in Denmark includes a music CD and an alphabet a bit longer than ours. The art style is earthy with hand lettered text that lends a sense of spontaneity. Note that in the X picture, the illustrator has included an extra detail that’s not in the text – the presumably illiterate witch uses Xs when writing. X is the loop you binding in curl (knot used to bind a curl?). X is a pink plaster on the wound. X is a pair of scissors to cut kay in your hair (to cut your hair?). X is in Texas, and Alex and Brix. X is a letter which rhyme witch (which rhymes with witch?)! to shoot what they saw. Dylle shot a frying pan. These few books demonstrate a range of art styles and philosophies about illustration from bright and lively to deeper, more contemplative works. Not unlike the range you will find in an American bookstore or library. 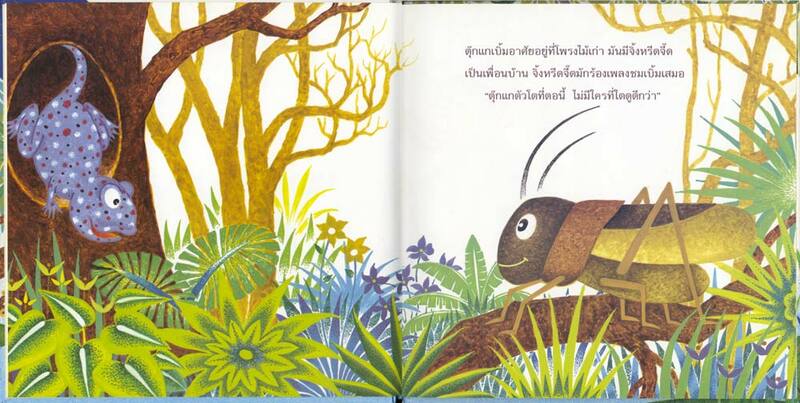 But the flavor of each country’s books for children does carry some essence of the place they are from. 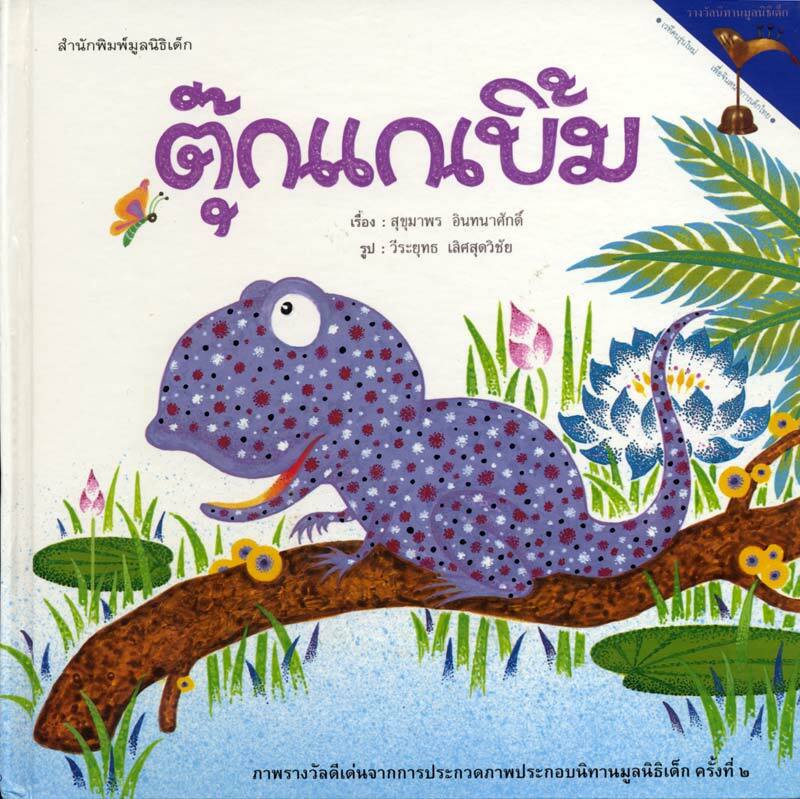 To see more picture books from other lands, check out this post and this one and this other one from my blog. (I especially recommend the third one, vom Kleinen Maulwurf, which is really funny). This entry was posted in Art, children's books, process, the world, World of Books and tagged book art, children's books, picture books, world books. Bookmark the permalink. Post a comment or leave a trackback: Trackback URL. Wonderful post! 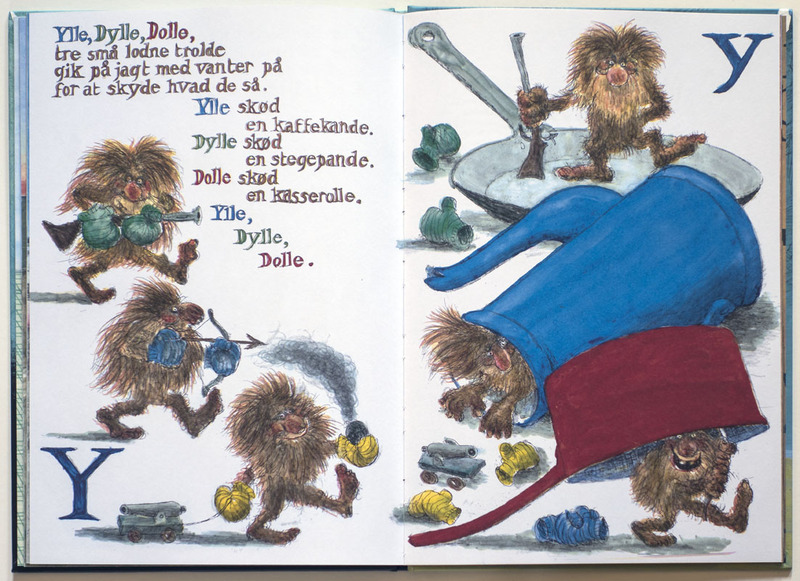 All the illustrations are fascinating, but I especially enjoyed seeing the Danish alphabet book because my great grandparents were from Denmark. That’s cool, Marcia.My husband just added three ancient Latvian picturebooks to the collection. One is from 1948, shortly after the war. I will do a post about those after he translates them for me. Thanks for your good, open mind.